Happy Halloween guys! I think I've already gained a pound from all the candy I've been eating! lol... I hope you all have some fun plans for tonight. I will be taking Chase trick-or-treating with some friends while Kevin stays home and hands out TONS of candy. It's supposed to be a nice night so I'm sure the streets will be overflowing with little ghosts and goblins! I've been busy the last two weeks making lots of items for my Etsy store and my upcoming Christmas shows. I will also be decorating houses for Christmas starting the second week of November, so I will have alot to show you in the next several weeks! Thank you all for keeping my hubby in your prayers. He has an appointment with the neurosurgeon on Wednesday morning. We are being patient but things are moving so slow! I'm sure we will know something on Wednesday and it will all be good news. 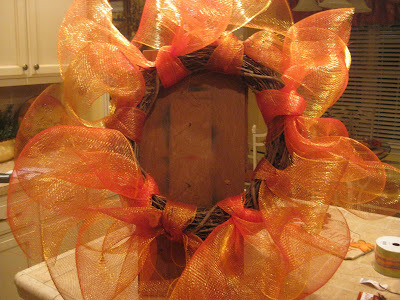 Oh...if you made a ribbon/mesh wreath I would love to see it! Have a safe and happy Halloween!! Hey Guys! 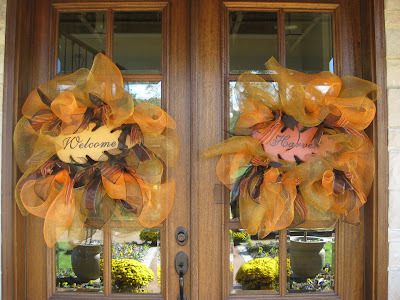 Thanks for all the nice compliments on the pumpkin arrangements and ribbon/mesh wreaths! 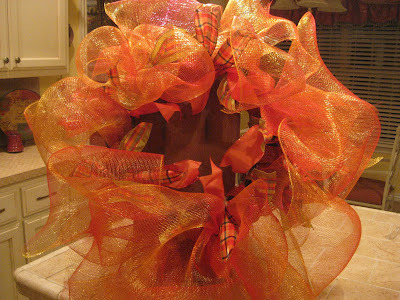 Alot of you wanted to know how to make the wreaths, you are about to see just how easy they are. In my last post I really didn't know what the netting/ribbon was called...it's called poly mesh. I bought this at a local store that carries a little bit of everything. I know Hobby Lobby carries something similar, but I haven't checked Michael's. 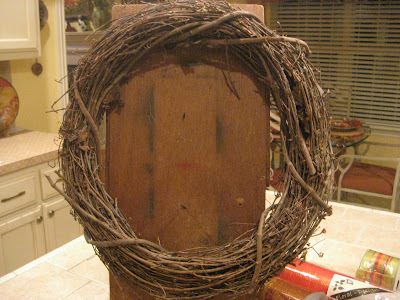 My friend Sherry saw my last post and really liked the wreaths and wanted me to make one similar, so I thought this would be the perfect time to show you how to make one for yourself. Here are the supplies... of course you can choose whatever you like. 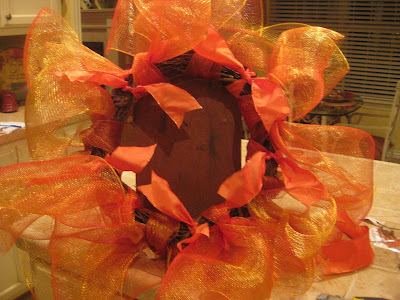 You will also need some sissors for cutting the ribbon, wire and a glue gun to attach the centerpiece. As you can see I alternated the two colors. Then I started tying the ribbon in knots in between the mesh. 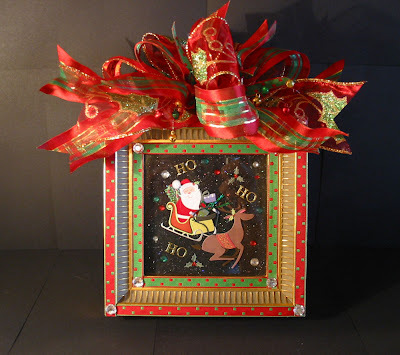 I believe each piece is about a half yard, also be sure and cut the ends of the ribbon into a triangular shape. 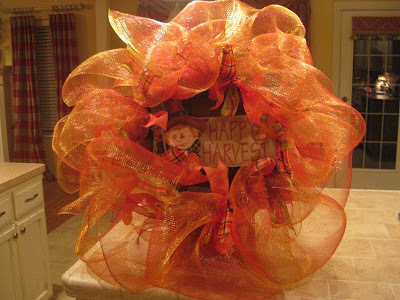 I kept adding the three different ribbons alternating them all around the wreath. Next I started fluffing out the mesh to give it a fuller look. I realized it needed a little more fullness so I added a few more pieces of mesh. 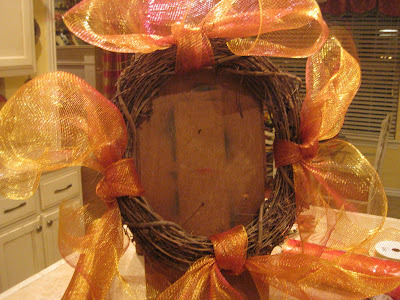 The last thing to do is add the centerpiece with a piece of wire. I used a little bit of hot glue to secure it on the sides. See there...all of you can make this!! It's so easy! The mesh naturally curls and is pretty easy to work with. You can fluff it out or squish it in to make it smaller. I hope I explained everything ok... if you have any questions you can leave me a comment or e-mail me. Good Luck!! Hey Guys! I hope you are all having a wonderful weekend! Thank you again for your continued prayers for Kevin. He's feeling pretty good and is not having much pain, thank goodness! It might be a few weeks before we hear about the "mass" but I will let you know as soon as we do. We are still confident everything will be ok.
Getting on with everyday life...I helped a sweet lady decorate for a fall party yesterday. 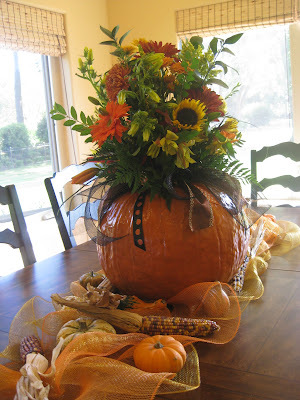 I made fresh flower arrangements in pumpkins for the centerpieces. 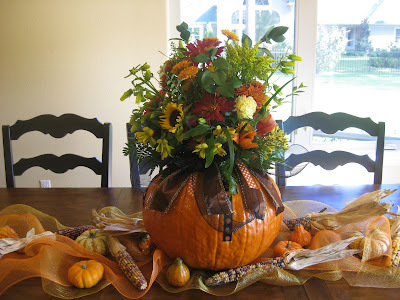 I used all kinds of fall flowers including sunflowers, gerbera daisies, mums, lillies and even picked some of the greenery from outside. After I finished I noticed the bottom looked waaaaay to plain so I added different ribbons around the base of the flowers. You guys know how much I love ribbon!! 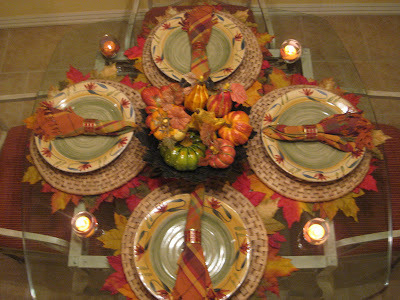 I also used wide fall colored netting along the center of the table and added fresh mini pumpkins, gourds and dried corn. 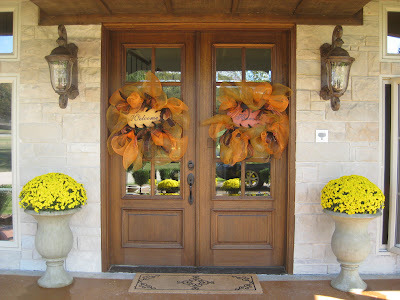 I made these wreaths for her front doors. She wanted something different and she loves that wide netting. 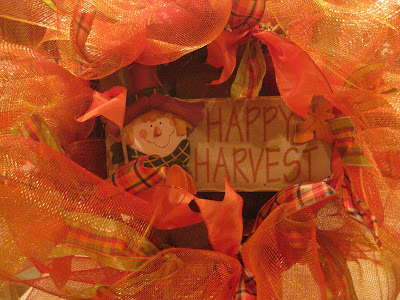 These are simple to make...I just tied the netting and ribbons all around the grapevine wreaths and hung the signs with wire in the middle. Easy! She loved how they turned out. Maybe this gave you some ideas...thanks for stopping by!! Hey guys, First of all thank you so much for all the prayers! I read each of your comments today on Kevin's Iphone in the hospital room. I am very touched and really appreciate you all thinking about us. After the doctor called the other night we were a little freaked out. The surgery he was scheduled for was not major, but just a little tricky. Then when he called so late at night to say they found the mass the size of a softball...well, you can probably imagine and maybe some of you know how we felt. I immediately thought that we needed all the prayers we could get! The good news is that they went ahead and did the surgery after looking at the ultra sound and finding out they were not related. The surgery went well! He came through just fine, he will be off work for a while, but all is well. Now...today he had an MRI so the doctors could get a better look at this "mass". By looking at the CT scan and ultra sound they think it could be a bundle of nerves with cells that have attached over years. They don't think it is malignant...and we are going to believe it is not either. Now we just need to pray that the MRI will show exactly what this is and that the doctors will know how to treat it. Hopefully we will know something soon. So for now Kevin is going to rest and heal from the recent surgery and I'm going to do my best to take care of him and go on with life as usual. We will deal with the other when we need to. We are choosing to think positive...it's all in God's hands. Thank you again, and please continue to pray. Hey everyone! Welcome to Met Monday hosted by our gracious Susan at Between Naps on the Porch . Please pay her a visit for a list of all the participants. 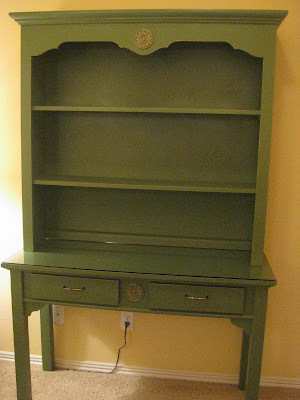 Today I am showing you a desk and hutch I bought at a flea market a few months ago. I have needed this for a long time for making my crafts, the kitchen table just wasn't working anymore! I have an extra bedroom with a piano so decided to squeeze this desk in there and make it a hobby/music room. As you can see it's nice but a little too country and not the right colors. I decided green would be the best color and would look good against the gold walls and go with the rest of the room. So off to Michael's I went! I bought fern green patio paint, it's an indoor/outdoor paint. I've never used it before, but it said it worked on wood and it went on really well without even sanding. I ended up putting two coats on and used antique gold rub n buff to add a little bit of an antique look. After it was all done, I sprayed it with a low shine clear sealer. Oh...and the chair you see was my neighbor's. They were throwing it out, so I picked it up! It will be recovered in a gold chenille fabric. I also found some cute plaid fabric for a pillow. As you can see I covered the hearts with a round decorative piece of wood from Michael's. They worked perfectly! I also purchased new hardware from Lowe's. Nothing fancy...I was kind of in a hurry picking it out, hubby was waiting...lol. Click to enlarge. In these pictures you can see the gold highlights. I rubbed a little on the hardware too. I also had a piece of glass cut for the top because of using a glue gun. This was hubby's idea. I bought curtain rod holders and wooden dowels. It holds my ribbon perfectly, but this is not even half of what I have! 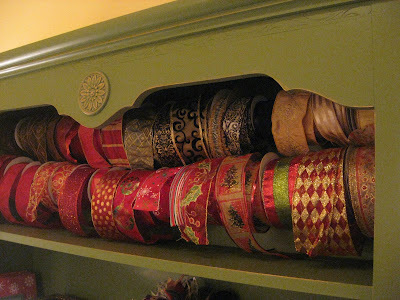 I can't stop buying ribbon!! I would show you the rest, but unfortunatly I am very messy when it comes to creating! 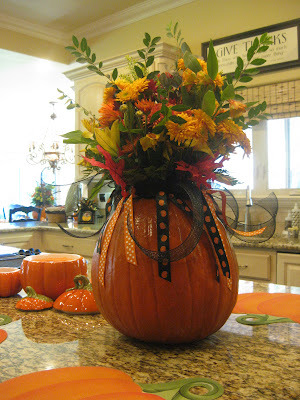 Since it's getting close to Halloween I wanted to show you this arrangement I created for a lady last week. I thought it might give you an idea. 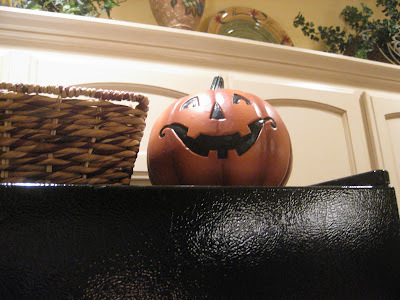 Halloween will be here before we know it...I need to go buy candy! We have about 200 trick-or-treaters...that's alot of candy. I have to budget for it! Thanks for your visit!! I hope you enjoyed my desk redo! More frames soon... Remember you can e-mail me for a custom one. Hey guys! I hope you are all having a great week! 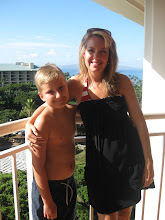 I hope everyone is well...Chase has a sore throat and was home today and I had one last week. I think there's alot going around right now. Congrats to Pat...the winner of my giveaway! I will be shipping out her loot out tomorrow. I will be having more giveaways a little closer to Thanksgiving and Christmas...so you will still have some chances to win! I know I said it in my video... ( Ooooh! the sound of my own voice! :0 lol) but I really appreciate you all. I don't decorate alot for fall, I would love to do the living room, but I know I wouldn't be able to stop at just a few things, I would want to go all out! 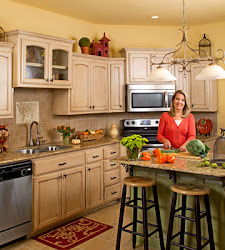 So I choose to just do the kitchen. I also do a little in the front yard that I will be showing you soon. (it's not much) Here is my table... 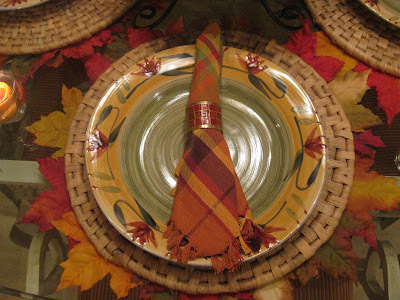 I had the plates, round wicker place mats and faux pumpkins and gourds. 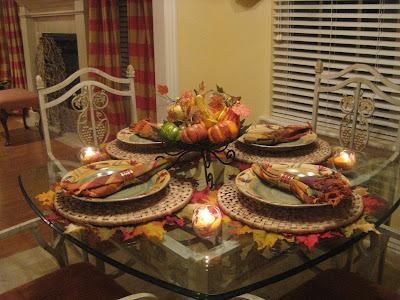 I added the napkins I found at Bed Bath and Beyond and the leaf bowl from Hobby Lobby. 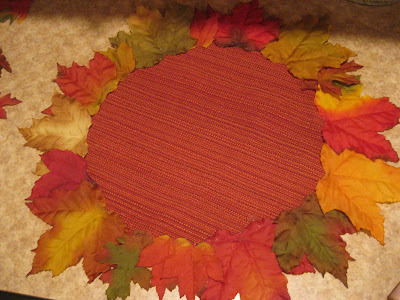 I made the leaf placemats. They were not my idea though, I saw the idea on Lauri's blog... Bargain Hunting with Laurie. She's on a blogging break right now, I know we are all missing her though. Anyway, I thought it was a great idea. My table looked so plain, now it's more colorful! They are simple to make, I have instructions on down below. 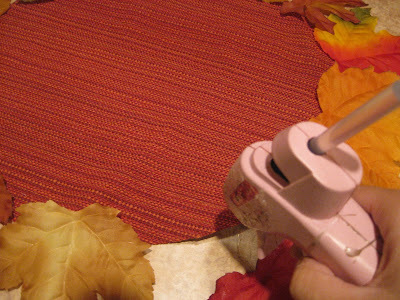 I had material left over from my curtains in my bedroom, so I just cut out 4 circles and glued the leaves around it. SIMPLE! Here they are finished... 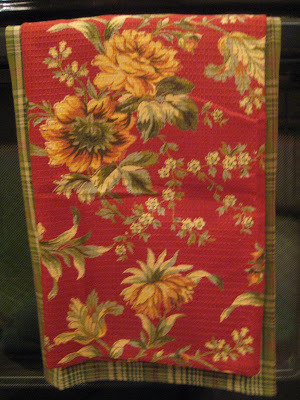 I put the wicker placemats on top so the material doesn't show... although, it's a good color. 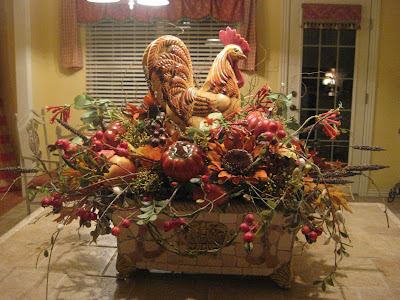 I know some of you have seen this rooster arrangement a million times, but I just wanted to show how I dressed it up for fall. I added fall leaves, pumpkins, and gold sunflowers. 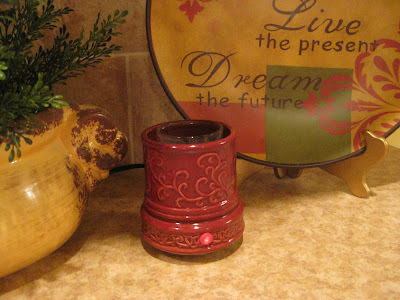 I dressed up this candleholder for fall, it was simple too. 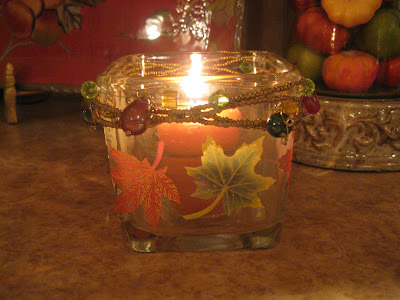 I bought the glass candle holder at the dollar store and added fall leaf stickers, gold beaded wire and some jewelry beads I already had. I just hot glued them in the corners. Another easy project! 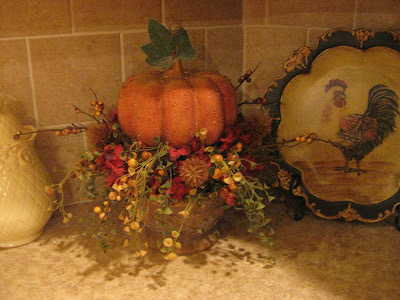 I made this pumpkin arrangement last year. 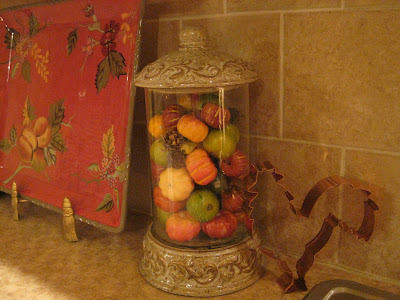 I had green pears in this jar, but found some small pumpkins and mixed them in. Oh and see that cute little rooster cut out! 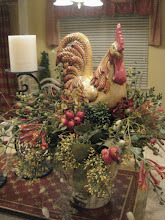 My friend Cathy frome Mille Fleur sent that to me as a thank you. She is just the sweetest! She also sent me some cute little towels pictured below. 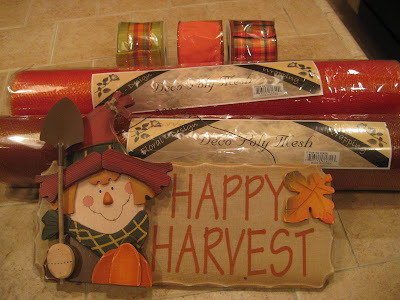 I bought the pumpkin towel at Homegoods in Dallas, but prefer the red one from Cathy. Although this one is cute for the season. Have you guys ever used a candle warmer? My friend bought this for me for my birthday, I put a pumpkin candle from Yankee in it and it really smells up the whole kitchen. You just turn it on and it turns it into wax. I love it! 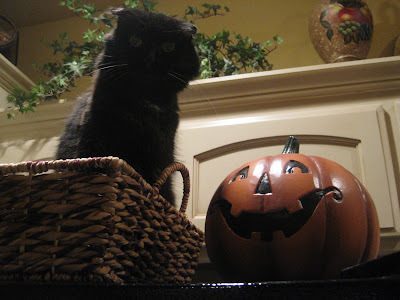 My only indoor Halloween decoration. I hope you enjoyed my little fallness! Before we know it...it will be Christmas time!! Alot of you have seen my Christmas frames and even purchased some last year. This is an example of what I will be doing. I have ordered alot of new embellishments and will be making all kinds of frames. Maybe even some intial ones for Christmas. Hmmmm...My creativity is officially flowing!! I will have more everyday frames for sale soon! Look for some Christmas ones soon too, I'm going to start early this year! I hope you all have a great rest of the week and weekend!! 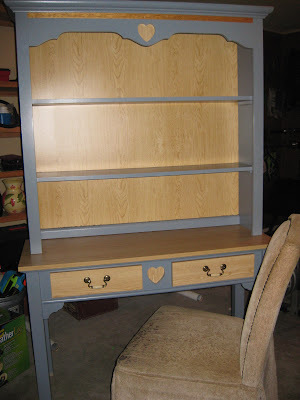 Monday I will be showing you my craft desk redo! Hey guys! We have a winner!! Thank you all for entering my giveaway! I really appreciate all the response. I can't believe I actually did a video...you will definitly know I'm from Arkansas now! lol...Congrats to Pat at "Deep in the Heart" You are the winner... please send me your address and I will ship out your prizes! !